Subscribe to the Belabored RSS feed here. Subscribe and rate on iTunes here or on Stitcher here. Check out the full Belabored archive here. Tweet at @dissentmag with#belabored to share your thoughts, or join the conversation on Facebook. Belabored is produced by Natasha Lewis. A first book launch from our very own Sarah Jaffe! For over two years she has painstakingly chronicled and analyzed social movements since the 2008 financial crisis, and Belabored couldn’t be prouder to present the final product with an exclusive interview with the author. 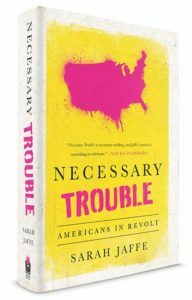 From the other side of the mic, Sarah discusses the political developments depicted in Necessary Trouble, drawing connections among the activists and campaigns she’s followed in her reporting over the years, and illuminates new horizons in American radicalism. In other news, we look at another digital newsroom organizing battle, India’s child labor loophole, a right-to-work showdown in West Virginia, and Olympic sexism. With recommended reading on a union battle at a Trump casino and labor’s decline in the shadow of Trump. Read the first chapter, and check out Sarah’s national book tour dates here.